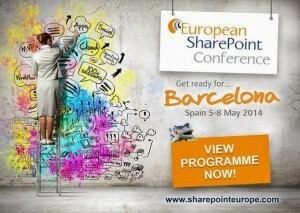 The European SharePoint Conference is less than three weeks away and I’m delighted to be part of such an exceptional line up. 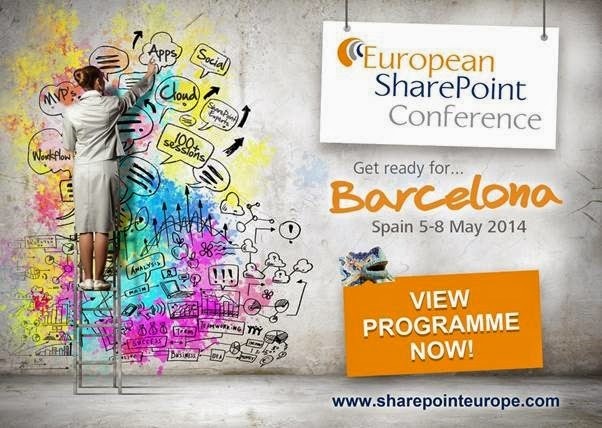 The conference will take place in Barcelona, Spain from the 5-8th May 2014 and is Europe’s largest SharePoint event bringing you great sessions and the latest innovations from Las Vegas. I will be conducting a session called “Social Business Value Demystified: Real-World Experiences” aimed at Business Decisions Markers and End Users. In this session I will outline why social technologies are useful for the business and how to align them with the business value. I will focus not on the technology but the reason why we use it. The rationale for this session topic is sharing what we have learned from the customers that use our best-of-the-breed social network for SharePoint on premises: Beezy. Get a free whitepaper about the 4 Enablers of a Social Intranet. On the April Fools Day, I have received the confirmation that my MVP Award has been renewed. I wish to thank to everyone who made it possible: the conference and community event organizers, the sponsors, Microsoft community leads and, of course, the attendees that come to the community to learn, mix and network. Thank you very much! This year has begun with me speaking at SharePoint Saturday Stockholm in January. Then, the most expected SharePoint event of the year: Microsoft SharePoint Conference 2014 in Las Vegas. Right now on my radar there are three more events: SharePoint Saturday Belgium later this April, the European SharePoint Conference Barcelona in May and SharePoint Summit Toronto in late May. The community work never stops.